Nothing much as changed since this article was written (1997), except the fact that oil pans are not available new anymore. Cross references of OEM part numbers to Moss part numbers have been eliminated on this item. With the following, all concerns about the above should be cleared up and if you have the correct combinations. Engine identification prefixes are applicable to USA models. 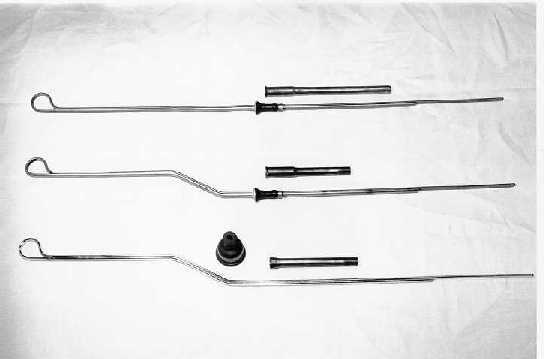 The lower dipstick shown 12H74 (451-350), dipstick tube 1B1063 (460-030) and dipstick boot 1B1735 (460-040) can be found on all 18G, 18GA & 18GB engines, also 1B1735 (460-040) and 1B1063 (460-030) can be found on all MGA engine blocks with MGA straight dipstick 11G64. Moss uses 451-350 for this application which actually is a curved dipstick used on 18G, 18GA & 18GB engines. The correct MGA oil pan is 1G2508. Oil pan part# 12H395 is fitted to 18G and 18GA engines. 18GB engines use 12H1426 oil pan. All these oil pans have an indentation immediately below the dipstick with, the dipstick resting on this indentation. Middle dipstick 12H2964 (451-355) and dipstick tube 12H2966 can be found on all 18GF, 18GH & 18GK engines only. This dipstick has a built in stop and locates in its matching dipstick tube (this tube is not the same as 1B1063 (460-030), although it is also threaded and screws into the engine block). In this case the dipstick does not rest on the oil pan indentation. The correct oil pan to use is 12H1426. Upper dipstick 12H3963 (451-345) and middle dipstick 12H2964 (451-355) with dipstick tube 12H3351 (460-035) can be found on all 18V engine blocks. Both dipsticks are interchangeable with each other, the dipstick tube is unique and is a pressed type fit. The correct oil pan is 12H3541 and can be immediately recognized by the lack of the indentation at the base of the oil pan in the immediate area of the dipstick location and also the relocation of the oil pan drain plug. Although dipstick 12G2964 (451-355) was supposedly only fitted on 18V883 (1977) engine blocks, I have seen these dipsticks on later cars. Likewise, I have seen dipstick 12H3963 (451-345) 1978 onwards fitted to some earlier 18V engine blocks; this is the same dipstick as found on the Austin Marina and it is quite possible that any dipstick that was available at that time was used. 5-main bearing engine blocks 18GB, 18GF, 18GH & 18GK have a rear main bearing cap design different from the 18V engine blocks. The design allows for a greater amount of oil drainage by way of a machined slot in the bearing cap. The matching oil pan 12H1426 is designed to be used with these engine blocks and has a wide channel incorporated into the design at the rear of the oil pan. The 18V engine rear main bearing cap has two smaller holes machined into this cap so, presumably, there is no need to have a wide channel incorporated into the oil pan design. Main bearing caps securing bolts found on the 18V engine blocks can also be substituted for the main bearing cap studs as found on 18GB, 18GF, 18GH and 18GK engine blocks. The confusion obviously lies in the fact that there are three different dipstick tubes fitted to various MGB engines. Use dipstick 11G64 and 12H74 (451-350) with dipstick tube 1B1063 (460-030) and oil pans 1G2508, 12H395 along with dipstick boot 1B1735 (460-040). Use dipsticks 12H2964 (451-355) and 12H3963 (451-345) with dipstick tubes 12H2966 and 12H3351 (460-035) and oil pan 12H1426 and 12H3541. On a final note, remember that when draining the oil the last amount of oil draining from the oil pan is the dirtiest, so you should never be in a hurry to refit the drain plug. When we change the oil, we prefer to have the vehicle elevated at the front and the engine warm. NOTE: Dipstick tube 12H2966 is no longer available. The above information was taken from the appropriate year and model OEM Driver's Handbook publication. When installing oil cooler kit to 1975 models and onwards, allow an additional .9 US pints. Obviously, when we change the oil and oil filter, we don't necessarily change the oil left in the oil cooler and hoses. The question is "should we?" The answer is "Yes!" and it is a relatively simple job to do at the same time i.e. disconnect the oil line at the oil filter, and direct to a waste oil container; attach a remote starter button between the fuse box and the starter solenoid wire; fill the engine with the appropriate amount of oil, then remove spark plugs and crank the engine over until clean oil appears.